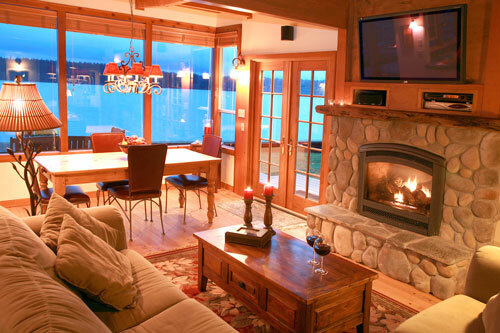 Designed by famed waterfront architect Robert Maloney, the Beach Hideaway will take your breath away. With its two bedrooms, 2.5 baths, gourmet kitchen, 42" Plasma HDTV and surround sound in the living room, massive river rock fireplace, decks to the water, and private hot tub, this bungalow sits on a private sandspit and has more charm and amenities than any waterfront getaway anywhere in Puget Sound. Once you arrive, you won't want to leave...it's amazing (just read some of the reviews, many from honeymooners). 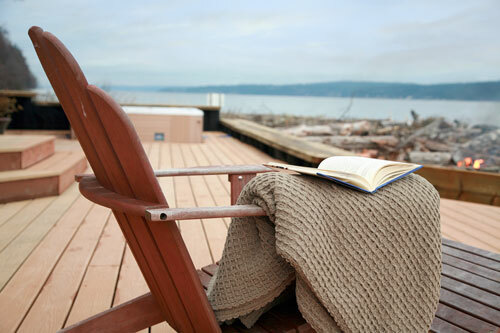 Set on a private spit of land in Puget Sound, this wood beamed cottage was originally built in the 1950s (when you could still build right on the beach). It is so remote that you have to use a four wheel drive Kawasaki Mule to even get to it. But don't worry, it's the Lexus of its class with comfortable, covered seating for four, plus plenty of luggage space. Everywhere, we strive to keep the best of the old, while incorporating the finest in modern touches and charm to make your stay nothing short of wondrous. We've even incorporated what the beach has given us for decor: driftwood retainer wall in the courtyards, and an old, long forgotten, abandoned beach beam from some far away land as our mantle. You have your own private beach with driftwood, clams, mussels, oysters, and so much to explore, as there are no other homes adjacent in either direction. The state of the art hot tub, away from prying eyes, where the ladies might relax with their wine, while the guys take a boat for fishing with a beer. Or maybe you'll all venture out in kayaks we can arrange for you. 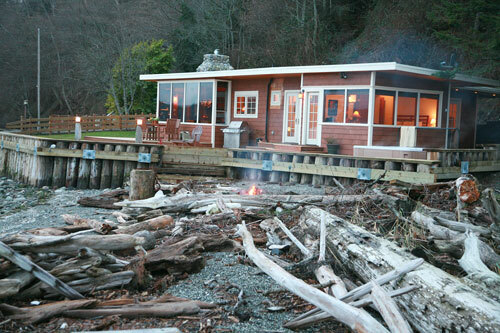 Inside, you'll find that the best of the old beach cabin with its old growth beams have been painstakingly preserved to former richness by Ron Milne, Master Refinisher. They are enhanced with rich slate, nails head flooring, warm wall treatment, and designer lighting to set the mood to make those special moments. Also, like the other WR properties, the house is a veritable art gallery, with each key painting set with museum lighting. These are some of the finest from the owner's private collection of over 300 pieces, and are meant to evoke a sense of romance and sensuality. The kitchen is a gourmet chefs dream...you'll want to go home and redo your own, except that you won't likely have a setting like this where you are viewing the ocean only feet from the kitchen window. It has every amenity with slate counters, stainless appliances, and all the utensils you will need to make those special meals for your special getaway. There's even a serving bar. It's set up with a couple of eating stools for the quick meal or to perfectly present the cocktail hour martines (Bombay Sapphire straight, very dry, with two olives for us)!. 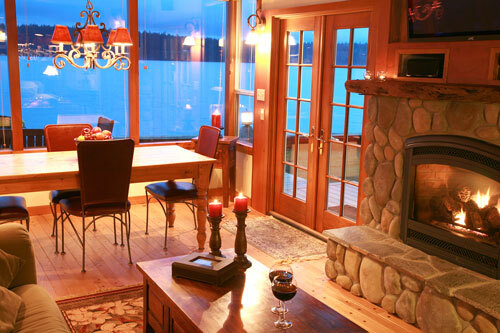 At night the dining table sits surrounded by glass with a beautiful chandelier, which you may want to dim to see the lights of the boats on the ocean. Of course, there is both formal outdoor dining, or our favorite is to be casual with the table side luxury chaise lounge chairs. Of course, there is a professional BBQ at your disposal. Or the unprofessional BBQ in the form of your own beach fire pit where you roast hot dogs and have smores on the beach. Yum! 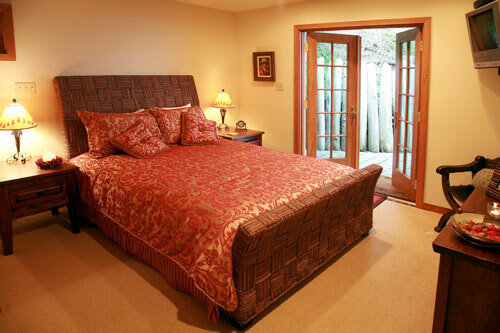 Finally, there are the bedrooms. We've left the best for last. The back bedroom has it's own ultra private stone courtyard reached by beautiful French Doors, perfect for your morning coffee with it's antique settee. 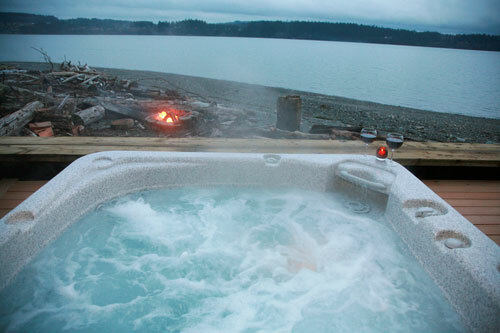 You will need to bring a robe, as the hot tub is just a few steps away. 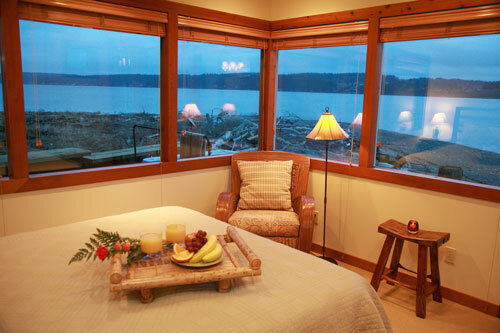 The waterfront bedroom has wrap around wood trimmed picture windows that bring the ocean to you. 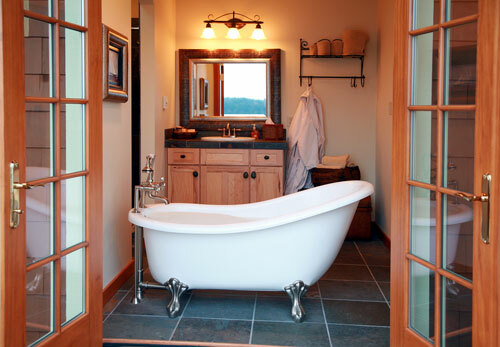 The bath is something you would see at a designer's showcase with both a tiled shower and a clawfoot slipper tub that has double wood French doors opening to a wrap around deck that steps right to the beach. 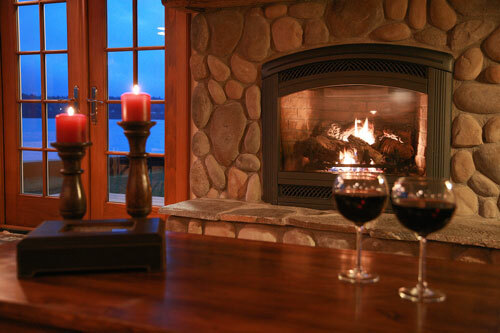 A glass of wine, a rose, a candle and a warm summer night at dusk...that's an experience you will never forget. We could go on and on about the Beach Hideaway; it's special because it's meant as the place for you to go with someone very special. We require a two night minimum stay during our off-season, and a five night minimum stay during the summer season and holidays.